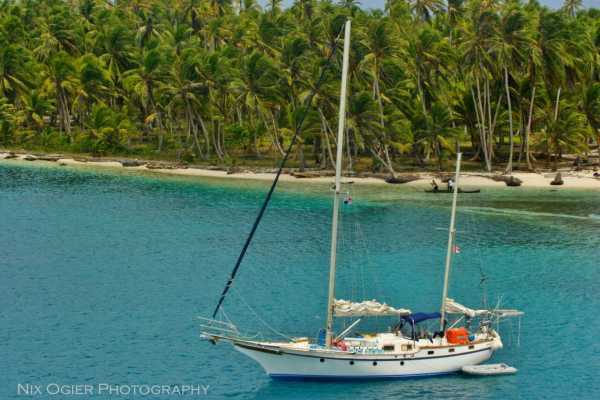 SOPHIA SAILBOAT PANAMA TO COLOMBIA ABOUT THE BOAT Sophia VI is a Vagabund 51 Ketch sailing boat, and is equipped with a 120 HP turbo diesel engine. The boat was built in 1985, refitted in 2014 with new rigging and got a new engine in 2017. It has GPS,life rafts and life jackets. There are 2 guest cabins plus bunks in the main area. There is one four person cabin with double bed and two single bunks. A two person cabin with a large bed. In the main cabin there are 3 single bunks and one double bed. The boat have 2 toilets and a large outside living area. There is also a kayak, snorkel gear and fishing supplies on board. CAPTAIN & CREW Andre is a graduate of the Colombian naval cadet academy in Cartagena de Indias and he holds a professional captains license. He speaks fluent English and Spanish, and is an outgoing and laid back character. In 2009 he spent time sailing in the Pacific ocean before returning to the Caribbean. He was employed for several years as a professional captain on various sailboats and catamarans, making over 100 crossing during that time sailing between Panama to Cartagena. In 2017 Andre purchased Sophia VI. ABOUT THE TRIP 5 days / 5 nights About 8 hours from Puerto Lindo to the San Blas islands. Approximately 3 days within The San Bas Islands. Followed by an ocean crossing that averages 35 – 40 to Cartagena, but can be affected by wind, sea and currents. Visiting different islands daily for nice beaches and snorkeling. Visiting a Guna community to see the local culture and customs. WHAT'S INCLUDED Accommodation onboard. 3 daily delicious meals made of fresh ingredients. Water & coffee & tea. Use of fishing gear. Snorkel equipment for all guests. Immigration assistance. COST & PAYMENT BREAKDOWN Total Cost = $575 Starting Jan 8th $50 deposit payment made to Cacique Cruiser to reserve your spot. $525 per guest for the boat trip paid to the captain. This price does not include the $20 Guna territory entrance fee, which must be paid to the captain in cash when requested. This price does not include transport from Panama City to the boats departure point. Canadian passport holders are charged an additional visa fee by Colombia of 190,000 Colombian pesos. Check today's exchange rate online. THE DEPARTURE POINTS & ARRIVAL LOCATIONS The boat departs from Puerto Lindo Panama. Guests must meet at restaurant at Casa X hostel at 5pm on the trip date for a pre trip meeting. To get there guests must pay for ground transportation. There are 2 options: The public bus. This will cost about $12 total, but you must depart Panama City's Albrook bus terminal to Colon by 8 am in order to make what is normally the last connection direct to Puerto Lindo at 10am. Schedule a seat in in a shuttle for $25, see shuttle details below. The boat arrives at Club Nautica marina in Cartagena. From there guests can easily take a taxi to main areas. Shuttle Details: There is a minimum of 2 guests required for this shuttle to operate. The shuttle costs $25 per guest and will pick you up between 12:30 and 1pm on the date of your trip. Your driver is Hernan, a very experienced an friendly driver. He will offer to stop at a supermarket along the way to give you an opportunity to purchase last minute items such as sunscreen, toiletries, snacks or alcohol. The $25 shuttle fee needs to be paid to Hernan in cash. The day before the trip we will add you to a Whatsapp group with our team, the driver and other shuttle passengers. This gives us an easy way to send out pick up times, communicate delays and answer questions others might like to know as well. To sign up for the shuttle all we need from you is a confirmation reply that also includes your pick up location in Panama City. The other option for transportation is the public bus. This will cost about $12 total, but you must depart Panama Citys Albrook bus terminal to Colon by 8 am in order to make what is normally the last connection direct to Puerto Lindo at 10am. Surfboards and kitesurf gear cost $5 additional for the shuttle, please let us know in advance if you are bringing these so our driver can plan to fit these along with the passengers and baggage. BE PREPARED WITH THE FOLLOWING Separate your luggage into two bags. One small ‘day pack’ for what you will need for the time on the boat and your main bag/backpack which will be stowed away. It is also advisable to protect luggage with large plastic trash bags. Snacks and beverages you want for the trip. We recommend shopping in Panama City as there are no big shops near the boats departure point. 2 copies of your passport. Cash to pay the ground transport, entrance fees the balance due on the sailboat trip, and any spending money you want for the trip. Sunscreen. Tight fitting T-shirt to snorkel. Mosquito repellent for nights without wind and evenings ashore. Sweat shirt or a light raincoat for the night. Towel. The boat supplies a mattress with sheets but no blanket If you get motion or sea sickness, we highly recommend that you buy motion sickness tablets from the pharmacy. INFORM US AND THE BOAT CREW IF ANY OF THE FOLLOWING APPLY You have health problems or conditions the crew should be aware of. You can’t swim. You have allergies to certain foods. IMPORTANT DISCLAIMER This boat is an independent boat which we represent as a guest service agent, because they are busy sailing and taking care of guests. Since we do not own and operate the boats we do not control the schedule, and cannot be held responsible for delays cancellations by the boat, or actions of the crews aboard the boats. However, in the event of a delay or cancellation we will provide guests with other available options, or refund their deposit payment. And if a guest registers a fair complaint or suggestion with us we will communicate with the boat and advocate for the guest in an effort to reach an amicable resolution.